Select the "Text Tool" icon from the Toolbox, then click in the canvas window where the Text Layer should be created. 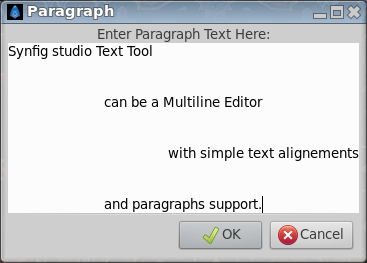 A dialog box will appear, allowing you to enter the text you want in the created layer. Enter the text, click "OK" button, and a new text layer will be created. In the dialog bog, if "Multiline Editor" is checked, ↵ Enter will add a new line, you can hit Ctrl⇆ Tab to give focus to "OK" button to validate. This page was last modified on 7 March 2016, at 19:37.